Clarity Glass Design has been supplying these fun and rewarding stained glass project kits for over 25 years. 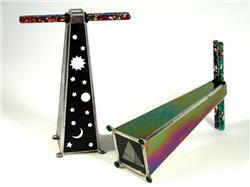 Here you will find kaleidoscopes of various and sundry types. The kits include pretty much everything but the stained glass. Click on a kit to read all the details. The Clarity Mini-Scope Kaleidosope Kit helps you create a traditional stained glass wheel kaleidoscope in a compact size. The completed scope is about 9 inches long. Due to the use of the .05" aluminized front surface mirror, the images are even brighter and clearer than in kaleidoscopes twice as large! Contains all the parts that a Clarity Mini-Scope Kit contains, minus the pattern and instructions; to wit: three precut pieces of aluminized front surface mirror, and a solid brass axle assembly with mounting eyelets. 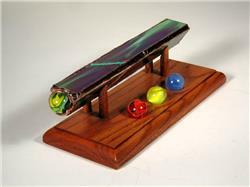 Note: The image shown is from Marblescope with multi-color marble in the image chamber. The Clarity MarbleScope Refill contains all the parts for the Marblescope, including front surface mirror, but without the patterns and instructions. 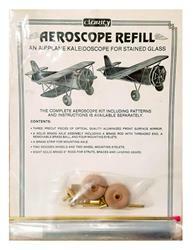 (As with the regular MarbleScope kit, you provide the colored glass for the outside of the scope.) You get three precut pieces of optical quality aluminized front surface mirror, four marbles, and a split-ring marble holder. This display stand is made from solid oak and measures 9" by 4". The Marblescope is cradled by four padded dowels while three indentations hold the extra marbles (or gallstones). ...of Yucca Flats, Minn. says, "I made up one of your Marblescope Kits last week and I used a gallstone from Big Jake, the third from the last of my ex-husbands. When folks look through the scope they can see a color advertisement for Miller's Lite Beer. I plan another such project soon." 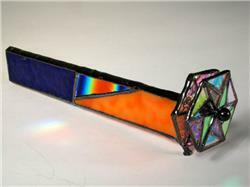 This stained glass Kaleidoscope Kit offers all patterns, instructions, and hardware necessary to make a 10" kaleidoscope from stained glass. The hardware packet includes an axle assembly, a set of brass legs, and felt foot pads. You must supply the mirror and the opalescent glass. 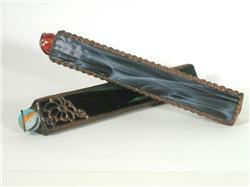 This is a very popular item to sell at flea markets and similar informal places of commerce. The next time you happen to be in the vicinity of one of these events, check out this year's going price for kaleidoscopes. 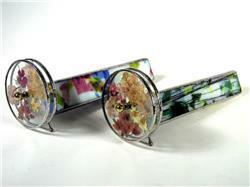 Contains just the axle hardware for the Clarity Kaleidosope Kit, without the patterns and instructions (or glass). The hardware packet includes an axle assembly, a set of brass legs, and felt foot pads. How many times have you wanted to do a stained glass project but didn't start because it seemed too complicated and time consuming? Here is a quick way to get into a project and get it done with time to spare. Fun packs have everything you need to complete the project. The primary project piece, the pattern and the glass (in uncut sheets). You use your own tools, solder and foil of course, but there is nothing else to buy. 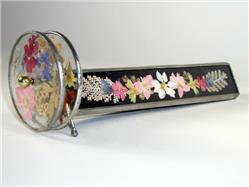 Contains all of the hardware, the uncut mirror, uncut glass, and pattern. 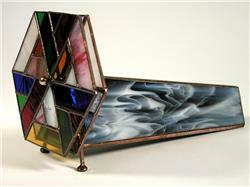 With the AEROSCOPE Kit you can make a unique stained glass kaleidoscope which looks like a classic airplane. Not your F-16, with all of its bothersome gun turrets and missile launchers and all of that nonsense, but a real, honest-to-goodness airplane like the Red Baron (alias Snoopy) would be proud to fly. 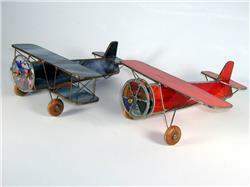 Each kit contains full-size cardboard patterns and step by step instructions for both Biplane and Monoplane designs. (Glass is not included.) The completed Aeroscope has a tapered fuselage and measures approximately 9" long by 9" across the wings. Peer into the end of this devilish device, and you will see things that even Snoopy, with his somewhat disordered perception, has never dreamed of. This is Aeroscope Kit minus the pattern and instructions; to wit: 3 pieces of Front Surface Mirror, 8 brass struts, 8 felt pads, 2 wooden wheels, flat brass strip, brass axle, various eyelets, and brass ball. How many times have you wanted to do a stained glass project but didn't start because it seemed too complicated and time consuming? Here is a quick way to get into a project and get it done with time to spare. Whittemore-Durgin Fun Packs have everything you need to complete the project. The primary project piece, the pattern and the glass (in uncut sheets). You use your own tools, solder and foil of course, but there is nothing else to buy. We have picked out some of the most popular projects in our catalog for this treatment. We have tracked the popularity of these projects for years. Just try one and see how quickly it goes! With Clarity's Aeroscope Kit and our glass selections, you can make a unique stained glass kaleidoscope that looks like a classic airplane. This cleverly designed affair uses a tapered mirror system to create the optical illusion of a three-dimensional sphere suspended against a black background, like a planet lost in space. Or like something your Old Uncle Charlie used to see from time to time. The finished scope measures 8-1/2" long. The kit contains three pieces of tapered front-surface mirror two Little Oil Wands, and other hardware, plus pattern and instructions. No glass (other than mirrors) is included. Contains all the pieces included in the Clarity Lost Planet Kaleidoscope Kit, minus the pattern and instructions. The kit contains three pieces of tapered front-surface mirror two Little Oil Wands, and other hardware. The kit consists of four lamination wheels, pressed flowers, front surface mirror, hardware, patterns and instructions with illustrations. Have you already made a Flowerscope and you absolutely love it? The Clarity Flowerscope refill kit includes everything except the pattern and instructions with illustrations - you already have that. Pressed flowers are provided, but you can use your own. If you peek into where the exhaust pipe ought to be you will be treated to a fairly pleasing sight. An angled mirror reflects the light coming down through the rotor blades through the optical system which involves several front surface mirrors and things. The kit includes mirrors, brass stuff, neoprene stuff, wire things, patterns and instructions. 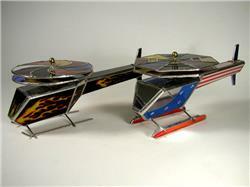 The glass is not included, and there is where your natural artistic ability will be sure to come to the fore, when you select just the proper kinds for each part of your Kaleidocopter. Contains all the parts in a Clarity Kaleidocopter Kit -- front surface mirror, a trapezoidal mirror, brass rods, axle assembly, mounting eyelets, etc. -- minus the pattern and instructions.